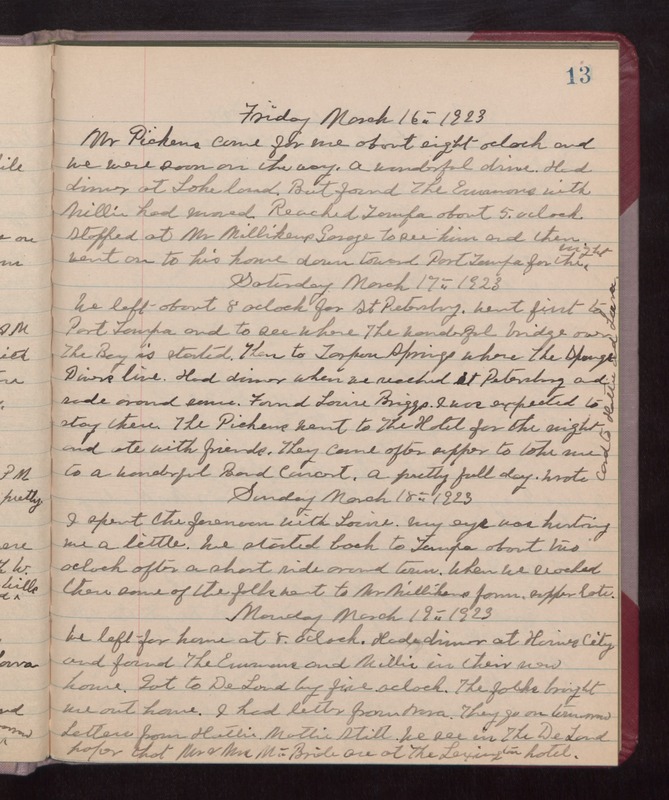 Friday March 16th 1923 Mr Pickens came for me about 8 oclock and we were soon on the way. A wonderful drive. Had dinner at Lakeland, But found The Emmons with Millie had moved. Reached Tampa about 5 oclock. Stopped at Mr Millikens. George to see him and then went on to his home down toward Port Tampa for the night. Saturday March 17th 1923 We left about 8 oclock for St Petersburg. Went first to Port Tamp and to see where the wonderful bridge over The Bay is started. Then to Tarpon Springs where the Sponge Divers live. Had dinner when we reached St Petersburg and rode around some. Found Louise Briggs. I was expected to stay there. The Pickens went to The Hotel for the night and ate with friends. They came after supper to take me to a wonderful Band Concert. A pretty full day. Wrote card to Hattie and Laura. Sunday March 18th 1923 I spent the forenoon with Louise. My eye was hurting me a little. We started back to Tampa about two oclock after a short ride around town. When we reached there some of the folks went to Mr Millikens farm. Supper late. Monday March 19th 1923 We left for home at 8 oclock. Had dinner at Haines City and found The Emmons and Millie in their new home. Got to DeLand by five oclock. The folks brought me out home. I had letter from Nora. They go on tomorrow. Letters from Hattie, Mattie Stitt. We see in The DeLand paper that Mr & Mrs McBride are at The Lexington hotel.